To be one of the front girls, but be in the "Under Girls" group. ^Definitely! Akicha got a lot of screen time, which definitely helps her popularity more then if she would have been in the back of River. I hope she'll shine in team A. She's on her way now. I think the girls would rather be in senbutsu even though they have to be in the back. But for me, of course, I would like to see my favourite girls in the front. It doesn't matter to me whether they are senbtsu or undergirls. I support her being in whatever group allows her tons of screen time to make those ultra cute facial expressions. She really did make the whole atmosphere of the Kimi no Koto ga Sukidakara PV. Hopefully, she would gain more confidence and will attract more cameras in the future. Yeah, she seems a bit shy sometimes and she often doesn't sound that confident when she talks. But I'm sure she will get better after getting more experience. Akicha got a new agency! Her agency are Watanabe Entertainment, same as Yukirin agency. This increases the chances of an Akicha PB release Perhaps she can team up with Yuki! An Akicha photobook would be bought by me instantly. I don't care if I have the money or not. That's a really good news!! I'm so excited. Me,too. I'll buy her PB immediately. - Aki is the middle of 3 sisters. Her oldest sister works as a gravure idol under the stage name Kizuki Jui. - She was raised in Tokyo, but born in Fukuoka. - First performed as AKB on 2008/08/23, at the AKB48 Summer Festival, and had her theater debut on 2008/10/19, the first performance of A5. - One of only two members of the 6th generation currently in AKB48. 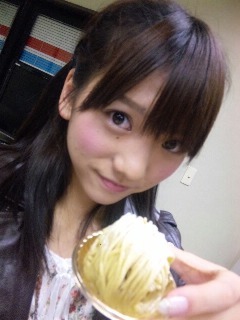 - Holds record for fastest promotion from theater debut as kenkyuusei to official member, 71 days. - Along with Sato Sumire and Kitahara Rie, has traveled overseas as an AKB member the most. - Came in at #23 in the senbatsu election, making it into Undergirls and 34 votes away from senbatsu. - Entered high school on a sports recommendation for tennis. She wasn't very good, even missing all 3 balls she was meant to smash, but the teacher said he liked the effort she was putting in. - Has a pet chihuahua called Win-kun. - Eats an umeboshi (dried plum) each morning and night. - Had a speaking role in the opening of the Oogoe Diamond PV. - Was an AKB fan before joining. - If she was to go to an overseas location, she'd like to go to Switzerland. - Imitations she can do include Togepi (from Pokemon) and a prairie dog sneezing. - Can get to sleep fast, and doesn't dream often. She finally has a blog! Naturally her blog is called "Akicha no Tea Time"
I hope she'll update frequently. Yupes, after I wait 3 day of writing "coming soon" in her blog, finally this day she write a first entry in her blog. lol, she don't use a new picture for her blog. Awesome, a blog to promote the upcoming photobook has been created! Slightly hopeful there.